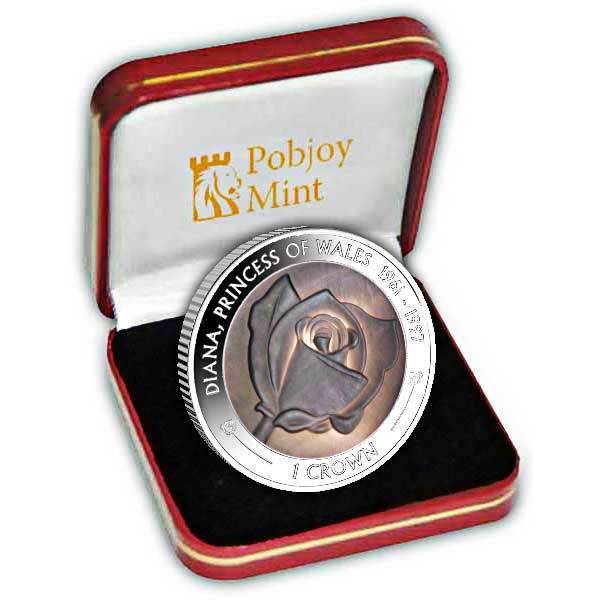 In tribute to Princess Diana whose life unfortunately came to an end on 31st August 1997, Pobjoy Mint presents a sensational coin on behalf of the Ascension Island Federal government to commemorate the 20th Anniversary of her Death. The fairy tale romance of Lady Diana Spencer and Prince Charles raised worldwide interest in Britain's Royal Family. On 29th July 1981 millions crowded the London streets to catch a look of the couple before they exchanged swears at St Paul's Cathedral. In the early years of her marriage Diana appeared a shy, personal member of the British aristocracy, nevertheless, her grace and nobility won the hearts of the nation and she soon blossomed into people’s princess. Throwing herself into her royal duties showing a heat and concern for all those causes she supported, Diana became the most photographed member of the Royal Family. 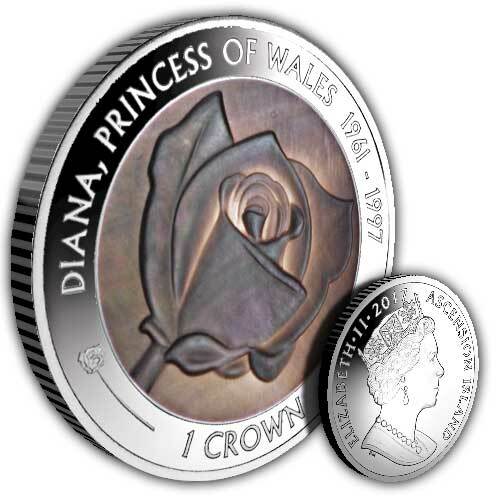 The centre of the reverse features a lovely Diana Rose, a rose named after Diana as she was known as England's Rose. We have achieved this unique finish by striking an indent into the coin and fixing an intricately sculpted piece of Mother of Pearl in the shape of the rose into the cavity. The colour of the Mother of pearl is distinct to each coin and features a mix of different colours and patterns.